There used to be more research and debate on the negative effects of labour resistance on economic development, but that topic has been crowded out by the intense focus on inequality of recent years. There now prevails a quiet presumption that labour movements have made only positive and large contributions to the historical rise in living standards. So I illustrate the relevance of labour relations to economic development through the contrasting fortunes of India’s and Japan’s cotton textile industries in the interwar period, with some glimpses of Lancashire, the USA, interwar Shanghai, etc. TL;DR version: At the beginning of the 20th century, the Indian and the Japanese textile industries had similar levels of wages and productivity, and both were exporting to global markets. But by the 1930s, Japan had surpassed the UK to become the world’s dominant exporter of textiles; while the Indian industry withdrew behind the tariff protection of the British Raj. Technology, human capital, and industrial policy were minor determinants of this divergence, or at least they mattered conditional on labour relations. Indian textile mills were obstructed by militant workers who defended employment levels, resisted productivity-enhancing measures, and demanded high wages relative to effort. But Japanese mills suppressed strikes and busted unions; extracted from workers much greater effort for a given increase in wages; and imposed technical & organisational changes at will. The bargaining position of workers was much weaker in Japan than in India, because Japan had a true “surplus labour” economy with a large number of workers ‘released’ from agriculture into industry. But late colonial India was rather ‘Gerschenkronian’, where employers’ options were more limited by a relatively inelastic supply of labour. The state also mattered. The British Raj did little to restrain on behalf of Indian capitalists the exercise of monopoly power by Indian workers. Britain had neither the incentive, nor the stomach, nor the legitimacy to do much about it. But a key element of the industrial policy of the pre-war Japanese state was repression of the labour movement. Note: By “labour repression” I do not mean coercing workers, or suppressing wage levels, but actions which restrain the effects of worker combinations. Nor am I saying unions are bad! 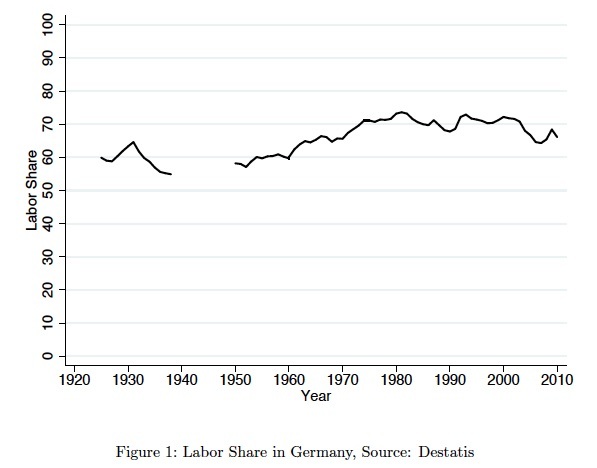 I’ve written before that unions in Germany are great. Also, I do not claim this post has any relevance for today’s developed countries. It’s mainly about labour-intensive manufacturing in historical industrialisation or in today’s developing countries. How does the State matter? As late as 1913, nearly 150 years after the onset of the Industrial Revolution, Britain still accounted for ~75% of the world’s exports of cotton textiles. The world’s second largest cotton industry, the United States, even after 100 years of high tariffs, could barely sell anything outside its own captive market. US mills had very high productivity, but the highest wages in the world still priced American textiles out of global markets. Those mills which did export were located in the South with slightly lower wages. British mills, on the other hand, had just the right combination of high productivity and high but not too high wages to dominate the unprotected export markets of the world. Precisely the opposite prevailed in India, China, and Japan. Their cotton mills had very low productivity by global standards which largely offset their low-wage advantage. But they could coexist with Lancashire by specialising in the lowest-count (‘coarse’) grades of yarn and cloth that Britain had abandoned decades earlier. Indian mills had also been exporting to global markets, including Japan; and before the end of the 19th century, Indian producers had driven British yarn out of China, which was Lancashire’s second most important export market after India. Yet the two industries had similar levels of productivity and wages circa 1900. Why was it Japan, not India, which supplanted Lancashire in the 1930s? Make no mistake: textiles were important to Japan’s industrial revolution. As late as the 1930s, when Japan was already undergoing heavy industrialisation, textiles (cotton and silk) accounted for 50-60% Japan’s exports, ~30% of manufacturing output, and <50% of manufacturing employment (Hunter 2003, pg 36; Minami 1986, pg 28). The decline of Lancashire is the subject of a voluminous literature in economic history. Many millions of words have also been written on the problems and premature decline of the Bombay industry in the interwar period, but the analysis is mostly qualitative. The literature specifically comparing the Indian and the Japanese textile industries in any depth is tiny — perhaps a book and a handful of papers. The above says, the average textile operative in different countries operated a different number of machines. At the extremes, a weaver in New England operated more than 5 times as many power looms as a Chinese weaver (8 versus 1.5), and a spinner in New England more than 5 times as many ring spindles as a Chinese spinner (902 versus 168). The typical operative in both India and Japan operated approximately the same number of machines: about 200 ring spindles per worker and less than 2 power looms per worker. Clark (1987) is famous for arguing that each worker operating more machines is equivalent to each working more intensely per hour: “In 1910, one New England cotton textile operative performed as much work as 1.5 British, 2.3 German, and nearly 6 Greek, Japanese, Indian, or Chinese workers”. Only a small fraction of the variation can be explained by conventional factors such as technology, capital-labour substitution, human capital, raw material differences, product quality, etc. Technology was largely the same across countries; and there was inherently limited scope for factor substitution. So there remains a large unexplained residual which Clark calls “individual worker efficiency” or the “level of effort” in different countries. Under the pre-war textile technology, a large part of the growth in the capital-labour ratio came from “stretch-out”, or making each worker operate more and more machines over time. Machines were also improved to run faster, or “speed-up”. Unless your machines were decrepit, it was usually cheaper to make each worker operate a larger number of your 20-year old machines than invest in brand new ones. Even when you did invest in new equipment, your investment paid off faster if each worker operated more of them. So labour productivity growth in textiles came from a combination of “speed-up” and “stretch-out”, which is equivalent to “labour intensification” — making each worker exert more effort for every hour of work. 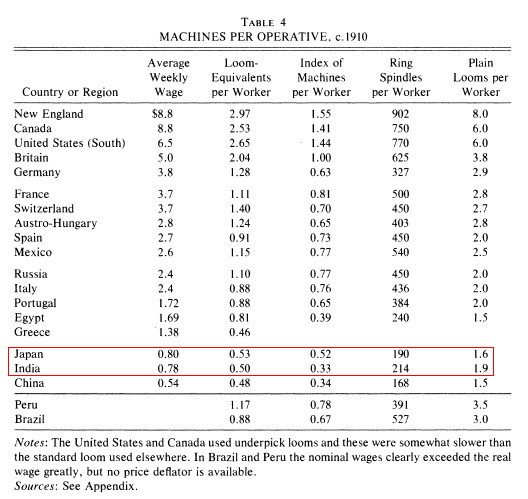 Clark (1987) notes that over the course of the 19th century the average Lancashire operative roughly doubled the number of machines tended, even as the speed of machines also increased. This higher workload makes it “unsafe to infer that the increase in output per worker resulted solely from technical progress”. That view is powerfully supported by Bessen (2012), who estimates approximately 1/4 of the 50-fold increase in cloth output per worker-hour between 1800 and 1900 was due to each weaver simply operating more looms than they had done initially. That’s really big. 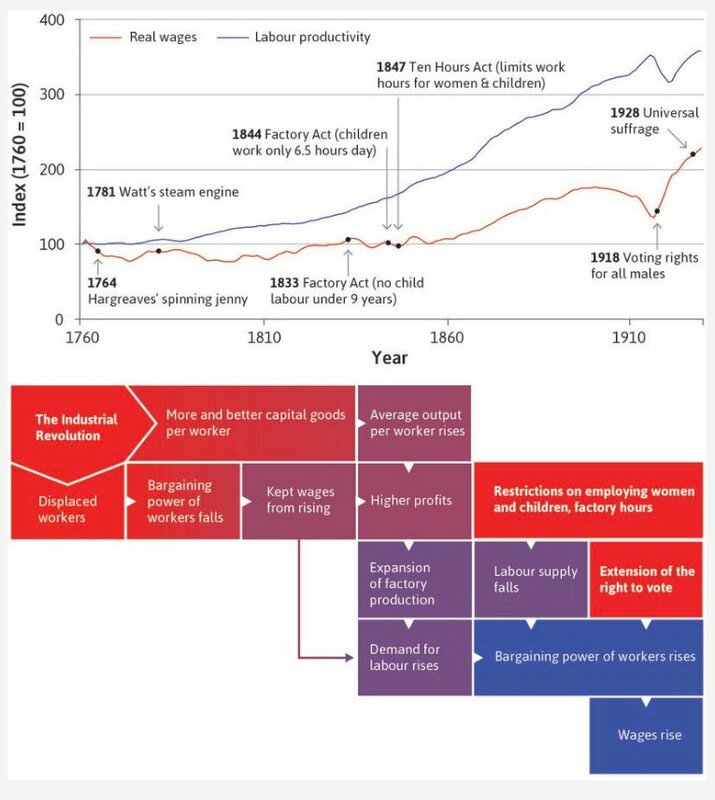 But if you cut off the initial quantum leap from the hand loom (1800) to the power loom (1819) and consider only the mechanised era after 1819, the share of the productivity growth due to greater exertion of effort is even bigger — more than 60% ! During that century, the work load in operating one single machine was reduced by technological changes which made machinery easier to use, more reliable, and less prone to error. The amount of labour time necessary to produce a unit of cloth was cut drastically. However, even as each improved machine became more “effort-saving”, management could also both increase machine speeds and make the worker operate an extra machine. In other words, over the course of a century, technological change did not reduce the amount of work for the New England operative, because he or she was made by employers to handle more and faster machines. The effects of technology were counteracted by a social process. By the early 1930s Japan had tripled its manning ratios to 600 spindles per operative and 6 power looms per weaver. The ratios at Japanese-owned mills in Shanghai had been doubled. But in India the average remained 200:1 and 2:1, i.e., unchanged since 1910. This means many more workers were employed in India to handle a given number of machines than in Japan. The change in Japan’s capital-labour (K/L) ratios is not an effect of installing more equipment (an increase in K), but an effect of making each worker operate more machines (a decrease in L). The Japanese textile operative was working harder every year. But the average Indian operative’s work load was no greater in the 1930s than in 1900-10. Labour productivity in Indian spinning grew by only 20-50% over 50 years. But at the same time, labour productivity on the Japanese side flew into the stratosphere, an increase of 400%. Japan’s machine speeds almost doubled, but this was not enough to account for the difference (400% against 100%). Besides, all things equal, faster machines imply more work for the operative. Wolcott & Clark (1999) also assess the number of auxiliary workers employed in labour-intensive tasks at Indian mills in the late 1920s, in light of the observed minutes required to complete the tasks per hour. Workers would have been idle approximately 80% of the total time required for such tasks. They conclude: “between three-quarters and four-fifths of the workers at Indian mills were supernumerary”; and “most of the [Indian] mill labor force was redundant”. According to Wolcott & Clark (1999), “labor costs in India in the 1920s were at least double the costs of fixed capital”, so the abysmal labour productivity in India was overwhelmingly the most important problem. In effect, the low-wage advantage of the Indian mills was offset by employing too many workers exerting too little effort in all stages of production. (Weaving shows the same pattern and isn’t shown.) The equivalent chart for Japan. Technological change and human capital differences were minor determinants of the Indo-Japanese disparity in machines per worker that emerged in the interwar period. As for technology… in the India chapter of a recent book edited by O’Rourke & Williamson (2017), Bishnupriya Gupta and Tirthankar Roy charge that Indian mill owners were indifferent and conservative about technology. But did technological change reduce intrinsic labour requirements in Japan during our period in question? A worker can certainly handle more machines if he has less to do on improved machinery. The short answer is: yes to some extent. But in general (a) the role of technological change is greatly overestimated; and (b) the role of labour relations in the successful implementation of technological change is greatly underestimated. I’ve relegated the tedious textile techno-geekery issues to a separate post (plus industrial policy and human capital). Here I address the most common issue raised in the literature: Japan developed a machine-making industry of its own which marketed its own automatic loom. Many books on late colonial Indian history complain that Indian mills were too slow in adopting the automatic (e.g. Bagchi, Banerjee, etc.). Indian managers had the choice of importing British, American, or Japanese automatics, but allegedly failed to seize the opportunity. The fully automatic or Northrop loom (as opposed to the power loom) did substantially reduce intrinsic labour requirements, so that in the USA, a single weaver on average could by 1900 handle either 8 power looms or 18 automatics (Bessen 2012). But circa 1936, only about 12% of Japan’s looms were automatic (Rose 1991); and the entire weaving sector itself accounted for a relatively small fraction of the value added in Japanese textiles. So automatics just can’t account for the huge disparity between India and Japan in textile labour productivity. The ability of mills to increase the capital-labour ratio depended on the relative bargaining power of workers and employers. In the global history of the textile industry, the issues driving industrial conflict always involved, inter alia, how many looms or how many spindles should be operated by each worker and at what wage. In the 1920s and 1930s, Lancashire weaving firms tried, and failed, to get weavers to operate more than 3-4 looms in the so-called “More Looms System“. Even within Great Britain, Scottish weavers refused to operate more than 2 looms per worker. At the global level, labour relations in cotton textiles could be represented by two extremes. At one extreme, New England mills in the mid-19th century were able to circumvent worker resistance and engage in the “unremunerated intensification of labour”. At the other extreme, powerful unions backed by the state during the Mexican Revolution forced a collective bargaining agreement upon employers which fixed the number of machines that could be operated by each worker (Gómez-Galvarriato 2007). Most of the world, including the famously unionised Lancashire, fell somewhere in-between. But late colonial India ended up being closer to the Mexican end of the spectrum even with little government intervention; and pre-war Japan in some ways exceeded New England. In my opinion, the best and purest illustration that industrial relations strongly determined labour inputs in the pre-war textile industry is doffing — or the removal of finished yarn from a stopped spinning machine. This is a measure uncontaminated by human capital differences or relative factor prices. Doffing was a manual operation which was not widely automated until after 1945. How often you stopped the machine to do doffing could be influenced by how high wages were. But once you did stop the machine, the number of doffs per worker per hour was just a matter of how fast the worker worked. Doffing was also close to the Platonic ideal of the zero-skill activity. According to Wright (1986), boys at North Carolina mills who started doffing at age 12 peaked by age 17. Yet in this simple task, a doffer in the USA doffed 6 times as much per hour as an adult Indian doffer. resist technological or organisational changes that reduce labour inputs, in order to defend the overall level of employment. Allen (2009) argues the rise in inequality in 1770-1840 was necessary to the capital accumulation that later helped raise real wages. This argument is generalised by Galor (2011). Although a more equal distribution of income can promote growth when the returns to skill are relatively high, nevertheless inequality can promote development through profit-driven capital accumulation when capital is scarce and returns to skill are relatively low. Similarly, Japan’s convergence with the Western countries was accelerated by capital accumulation coming at the expense of real wage growth. According to Broadberry, Fukao & Zammit (2015): “Japan overtook the United Kingdom as an exporter of manufactured goods not simply through catching up in labour productivity, but through holding down real wage growth so as to enjoy a unit labour cost advantage”. If British and Japanese workers had had greater bargaining power than they actually did in the earliest phase of industrialisation, especially in sectors most subject to technical change, would that have retarded economic development? These points imply resistance to higher capital-labour ratios, so it’s basically just a modern form of Luddism. Labour resistance is likely to matter most in an industry which uses a lot of labour — like pre-war textiles. But did labour resistance actually matter in history? Mokyr (1992, 2002 pp 259-61) entertained the possibility that labour resistance in the 18th century could have been an element in continental Europe’s later and slower industrial takeoff. Randall (1989) notes that relatively simple but strongly labour-saving inventions that had existed for decades or even a century like the gig mill were not adopted in the British wool industry because of worker resistance. The spread of similar technologies from cotton to wool within England were also likely delayed by riots and machine-breaking. Horn (2005, 2006) cites the fear of revolution powerfully affected French industrialists in the early 19th century, and this is one reason industrialisation took a ‘different’ path in France. The implementation of the so-called American system of mass production between the 1880s and the 1920s was predicated on putting an end to the craft control of production. Skilled artisans, who had been autonomous internal contractors, were replaced by a combination of hierarchical management, lower-skill labour, and high-speed, high-volume production technology. This phenomenon prevailed both in American textiles and in the US manufacturing sector as a whole (Lazonick 1990; Katz & Margo 2014). The proud craft workers naturally did not sit idly by, and they used their power of combination to resist such changes through strikes. Few ever consider the strikes of this period as something akin to Luddites or the Swing riots, but why not? Maybe they were the inevitable byproduct of the distinctive path of American economic development. It’s popularly assumed that firms usually have more market power than workers in setting the terms of employment. Even Adam Smith thought that employers, thanks to their resources, can out-endure any industrial dispute with workers. Modern labour economics often views labour markets as riddled with naturally monopsonistic tendencies. It’s also implicitly assumed in Arthur Lewis’s famous model of early industrial development that workers have no bargaining power of any kind. Labour supply is ‘unlimited’ and perfectly elastic thanks to huge ‘disguised’ unemployment in the ‘traditional’ sector. So higher demand for labour from an expanding industry does not translate into higher wages. You could just beat the fields with a stick and the peasants keep leaping out. Or at least that should be so until much of the “surplus labour” was absorbed by industry. But Alexander Gerschenkron implicitly argued that the supply of labour was relatively inelastic — at least in the short to medium run. Labour mobility could be quite limited because information about job opportunities was poorly disseminated, and/or until the necessary infrastructure was built up. And interregional mobility could also be limited by customary inhibitions, ethnolinguistic fragmentation, etc. India, to this day, has relatively low labour mobility. The ‘effective’ supply of labour could be also limited because peasants did not necessarily make a reliable, disciplined labour force for the factories. Employers had little information about worker quality or reliability. The earliest factory workers were lacking in what Mokyr & Voth call “discipline capital” — non-cognitive ‘skills’ like punctuality, sobriety, reliability, docility, and pliability. Whether they had been peasants or artisans, early workers were new to industrial work habits and they had a strong preference for autonomous work arrangements. They were accustomed to setting their own pace of work in farming, domestic outwork, or artisanal workshops, and disliked the time rules and strict supervision of the factories. All this is consistent with colourful descriptions of the early history of the textile industry in the Global South, including Japan. Mills were described as places of chaos and disorder. They were supposedly filled with workers ‘idling’, ‘loitering’, ‘socialising’, smoking, tea-drinking, or just disappeared for the day. In Japan, “twenty percent of the female operatives…absent themselves after they receive their monthly pay check” (Saxonhouse & Kiyokawa 1978). In Shanghai, it was said female mill workers could be found breast-feeding infants during work hours (Cochran 2000). Or at Mumbai mills, workers “bathed, washed clothes, ate his meals, and took naps” (Gupta 2011). So “reliable labour” was scarce in early industrialisation, and workers could derive some market power from that situation. Employers had fewer outside options and higher replacement costs if production was disrupted, than is suggested by phrases like “surplus labour” or the “reserve army of labour”. When urban labour markets deepen, there are still imperfections which keep them from being a spot market for labour inputs. In the late 19th century United States, which is often depicted as a model of laissez-faire, Naidu & Yuchtman (2016) find evidence of pervasive frictions and rents in the labour market. And it’s still possible to overstate the bargaining power of employers. Put quite simply: workers are more likely to stick together than capitalists. Given half the chance, and out of perfectly rational motives to get the best deal possible, workers everywhere will combine to bargain for better terms of employment. Likewise, firms typically would love to restrict competitive bidding for labour and combine in order to fix wages or suppress wage growth. But, all else equal, workers are better at collective action than firms. They deviate less from cartel arrangements. Left to their own devices, without interference from the state or the employers, workers organise more spontaneously to exercise monopoly power. Firms are more cut-throat, free-riding, dog-eat-dog, opportunistic defectors — at least if the product market is competitive. The ability to exercise monopsony power falls in proportion as there are many firms, ownership is diffuse, economies of scale are modest, barriers to entry are low, and the cost of changing jobs is not too high. With some notable exceptions, the pre-war textile industry in most countries fits that description. The collective power of workers even in the early 19th century to wrestle with employers over the terms of employment is powerfully illustrated by the emergence of collective bargaining institutions in British cotton. A series of bitter strikes by male spinners forced Lancashire firms to agree to “fair wages” enshrined in public lists having the “force of laws”. The same workers also frustrated the spinning firms’ attempts to replace them by introducing equipment which might be operated by women and children. Yet, at this time in the larger British economy, technology was constantly displacing workers and real wages were stagnant. Early industrialisation saw spontaneous strikes all the time in the absence of formal unions. To the best of my knowledge, no one has specifically studied unorganised strikes per se, but the fact that they happened frequently in early industrialisation is undeniable and testifies to the ‘organic’ solidarity and monopolistic instincts of workers. Just two out of an infinity of examples: in the General Strike of 1919, 100,000 workers walked out of the Bombay mills and there were no unions at all at the time. Or between 1929 and 1931, non-union workers across the entire textile region of the American South staged hundreds of spontaneous walkouts to protest increased machine assignments (Wright 1986). Only when these got national attention did outside unions show up. The prima facie evidence of the militancy of Indian labour is the size, duration, frequency, and generality of strikes. Between 1918 and 1938, the Indian textile industry saw at least 8 general strikes in Mumbai alone. Mumbai basically saw no production for large parts of 1928-29. 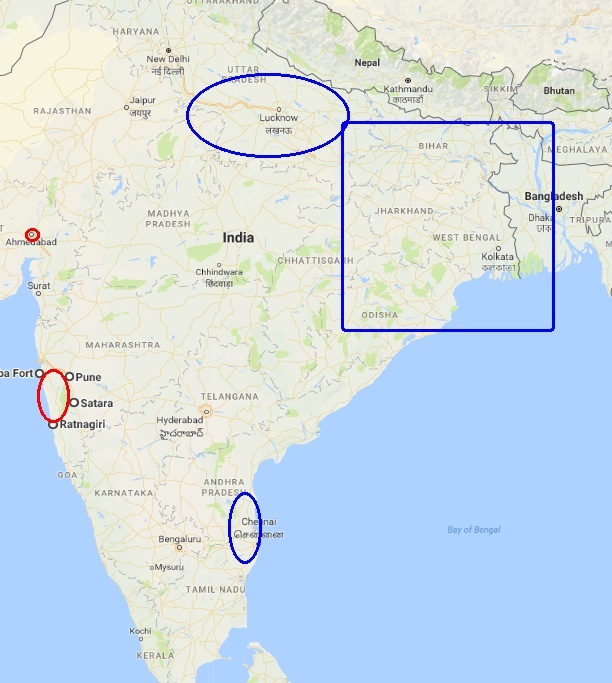 And this is before counting the general strikes in the second major textile centre, Ahmedabad, or the minor centres like Sholapur and Madras (now Chennai). It’s also before counting up to a thousand smaller firm-level strikes or lockouts or other troubles at individual cotton mills. Wolcott (2006, 2008) has compiled comparative strike data for the textile industries of Great Britain, New England, and the Bombay Presidency (which includes Mumbai and other mill cities). Note this does NOT include the big strikes that occurred in other industries, such rail, steel, docks, municipal services, etc. The turn of the 20th century in the USA and the interwar period for the UK are generally considered tense periods of labour strife and industrial conflict. Yet British and American millhands had absolutely nothing on their Indian counterparts. Whether measured in the number of workers striking per year per mill, or the number of strike events per year per worker, or the days lost per worker per year, Indian textile workers in the interwar period were true stars of the labour militancy league. See some of the descriptive stats. 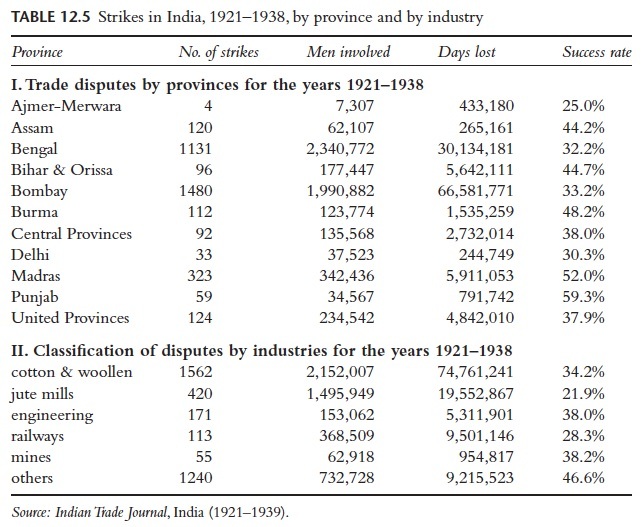 Mumbai clearly had the most fractious labour relations in India — accounting for 21 million out of ~32 million worker-days lost to strikes in all of India in all industries in 1928 alone. Ahmedabad’s strike data are much more moderate. This city (now in Gujarat state) is where a true formal union under a collective bargaining system had been in existence since the early 1920s, thanks to the mediation of the native son Gandhi. Yet Ahmedabad was still clearly much more strike-prone than the UK or the USA at any time between the 1880s and the 1930s. It’s difficult to argue the positive role of unions as ‘voice’ made such a big difference with Gandhian unionism. Before the late 1920s, Indian strikes outside Ahmedabad were largely unorganised. When there were strikes, ‘unions’ of sorts or strike committees would spontaneously emerge and then vanish after the strikes were over. This is amply documented in Newman (1981)’s detailed study of Mumbai’s general strikes. ‘Unions’ came and went with strikes. Formal unions with real organisation led by educated middle-class outsiders were more enduring in the 1930s, but even then they struggled to maintain leadership. It was typically workers who took the initiative and the unions followed their lead. Indian labour power is about the spontaneous militancy of the workers themselves, not the success of trade unionism. Wolcott (2008) argues “unorganized Indian workers could initiate a very large strike in as orderly and complete a manner as the most organized examples in English and U.S. labor history”. Morris (1965) quotes a government official in the 1890s noting that spontaneous organisation was made possible by an “unnamed and unwritten bond of union among the workers”. The first few general strikes concerned wages. But the general strikes of 1928 and 1929, and some in the 1930s, were explicitly to oppose ‘rationalisation’ — the attempts by the mills to reorganise production in the face of Japanese competition through work force reduction. Remaining workers would tend more machines, but at higher wages. ….’The workers in Bombay’, said Fred Stones, ‘seem to favour the idea of half work for everybody rather than full work for a few’. Workers who experienced fluctuating and uncertain conditions employment sought to slow down production and to control the intensity of effort which employers demanded of them”. You can call this by the pejorative US term featherbedding, or by the more positive “work-sharing”. Either way, it helps explain Indian workers’ resistance to higher machine assignments: accepting greater work loads = less employment. Labour unrest following the Great War appears to have been a global phenomenon. During the war, workers in many countries, including India and Japan, demanded pay rises to compensate for the inflation and succeeded in getting them thanks to the temporary labour shortage. But in the recession following the war, firms tried to reverse the raises, but workers saw current wage levels as customary and defended them aggressively. Of course …the Bolshevik Revolution… might also have had something to do with it, at least in stimulating labour to new possibilities. During the Great War and afterward, Japan also witnessed a flurry of strikes and industrial disputes in both textiles and the rest of the economy alike. Similar factors were at work as elsewhere: rising cost of living followed by recession and retrenchment. As for textiles specifically, according to the ILO, “[f]rom 1923 to 1929, the [cotton and silk] textile industries headed the list [of strikes] with an annual average of 92 disputes, or 23 per cent”. This is not surprising because worker discontent clearly existed. Conditions in Japan’s mills suffered from a terrible international reputation, very much as Bangladeshi garment factories have today. Saxonhouse & Wright note that an American visitor in 1900 described “Japanese mills as grim prisons, the workers attracted by misrepresentations, and kept against their wills in overcrowded, unventilated barracks”. Many Japanese contemporaries themselves characterised various strategies of labour recruitment by the mills as akin to indentured servitude. One historian of Japanese labour argues the “low wages and difficult working conditions placed [Japanese textile workers] in perhaps the worst objective situation of any group of workers” in Japan. Indian workers may have replicated in the city and on the shop floor the “solidarity networks” of the villages. Risk-averse, “safety first” peasants living in uncertain environments formed informal insurance schemes as mutual support in bad times; and this income-sharing cooperative equilibrium may have been unusually strong in India, with its rain-dependent, monsoonal agriculture (Roy 2007). The “moral economy” of peasantry may therefore have facilitated Indian workers’ spontaneous collective action as industrial workers. And it was maintained in the city, as in the villages, through a combination of social sanctions and threats of violence. When the mill workers struck, their goal was not only to stop wage cuts, but also to maintain the employment of their ‘village’ fellows. Workers could also return to their home villages and rely on income-sharing support systems when their resources ran out during long strikes. That is a speculation advanced by Wolcott (1994, 2008), but it’s consistent with the recreation of village governance and informal justice institutions in city neighbourhoods, such as the panchayat, as vividly described in Chandavarkar’s (1994) amazing sociological descriptions of the Bombay neighbourhoods and tenements (chawls). The city connections were just as important as the village connections, in terms of activism and support systems during strikes. But why was there so much more labour militancy in India than in Japan? Why did Indian workers display much more strike solidarity and discipline than the Japanese mill hands? The Japanese textile work force was, famously, more than 80% unmarried adolescent women. Saxonhouse (1976) observes “the Japanese textile industry’s labor force is clearly the most female and the most transient” of all the other national textile industries. Wolcott (1994), in line with the Japanese literature, attributes the near-zero union penetration of its work force to the transience and low attachment of the female labourers. The country girls intended only to work until marriage and then return to the farm. So they had little incentive for union-organising efforts because any gains from collective action would be “reaped by subsequent generations” and “strikers themselves would receive little of the benefits despite incurring all of the costs”. Strong job attachment can be a source of institutional rigidity. Committed workers are more tenacious in their demands than transient workers. In Lancashire, the elite male spinners were prickly and assertive about their craft status (Huberman 1996). Even in Japan, most of the mill hands who did strike emerged from the minority of commuting male workers. At mills in the US South, middle-aged men with families often did work such as doffing which, elsewhere, were done by children and teenagers (Wright 1986). …came to be dominated by men who had invested their identities and career aspirations in their jobs… These Southern mills were not unionized, but the mature mill village community developed strong notions of appropriate work organization and employer behavior. This kind of “moral economy” perception made drastic changes difficult. The bitter strikes [in the late 1920s and early 1930s]…. were marked by a sense of betrayal on the part of the workers at attempts to change accepted job definitions and work norms”. In addition to their transience, the Japanese female workers were also recruited at a great distance from the mill site (e.g., Okinawa girls working at an Osaka mill) and were required to live in strictly surveilled company dormitories. There would be no neighbourhood support networks. Tsurumi (1992), pointing to the difference in unrest from before and after the widespread introduction of the dormitory system in the late 1890s, is absolutely convinced that the surveillance and inaccessibility of the workers in dormitories was critical for preventing strikes and union organisation. In Japan, the labour supply decision also belonged to the household, not to the girl herself. The mills signed employment contracts with her father or brother and he received the much coveted signing bonus (although these contracts were rarely enforced when the girls ran way). Hunter (2003), which goes into some detail about recruitment practises over time, mentions when female workers did strike, the girls’ families often sided with the employers! If this holds generally, it’s an amazing contrast with Indian workers’ reliance on their village connections. If the above are valid, then what ever reason female labour was much more widely available in Japan than in India must have mattered to the Japanese textile industry’s advantage. It is speculative, but plausible, that even before the modern era, female labour may have been more ‘commodified’ in Japan than in India. The more advanced commercialisation of the Tokugawa period (1603-1868) in Japan had already created a deeper market for rural labour. Saito (2011) suggests this may be related to the rising female age of marriage in the that period, explicitly comparing with the “Western European marriage pattern” of Hajnal and Laslett. The Japanese mills suppressed strikes and thwarted union penetration. When unorganised strikes popped up, employers defused them through a mix of minor concessions, unleashing hired gangsters, police arrests of the agitators, and getting rid of the most troublesome malcontents. They could just get more of them where they came from. Japanese employers could therefore squeeze as much work as possible out of their workers — make each of them handle more machines — without fear of resistance which might disrupt production. Those workers who didn’t like the intensity of work could escape — exercise their “exit option”. Again, the employers could find more where they came from. But Indian mills, as an industry, were far more dependent on a core of committed, long-tenure workers, and individual mills walked on eggshells in fear of potential protest from workers. The Indian employers found it quite difficult to get rid of the uncooperative ones and obtain adequate replacements for them. A country as impoverished as India, with such a large potential pool of labour for industry, ‘should’ have been able to intensify work effort, as Japan did. And they ‘should’ have been able to use scabs/blacklegs to break strikes more easily. Instead, Indian mills faced a combination of wage rigidity and labour resistance even worse than the textile industries of the much richer countries during the 1920s and 1930s. Pre-1945 Japan was almost a parody of the Lewis model of development — or more accurately, of the Frei-Ranis extension with balanced growth in agriculture and industry. Growth in population and agricultural productivity induced large-scale migration from the countryside to the cities. At the same time, the remaining farm households increased the hours and days worked per year (Mosk). So real wage growth was stagnant or moderate despite rising industrial demand for labour. This process slowed down after WW1, when real wages in the economy as a whole increased and you saw the first signs of some wage rigidity. But Japanese cities had by then a large pool of workers in the urban informal sector which the mills could tap (Taira 1978; 1989; Francks). If Japan seemed to fit some version of the “surplus labour” model, then late colonial India was more ‘Gerschenkronian‘. First and foremost, there was basically no structural transformation in late colonial India: in 1875-1947, agriculture claimed ~75% of the work force. Any labour ‘released’ from agriculture would be due to population growth. But the ‘effective’ supply of labour available to industry was reduced by low rates of geographical mobility, especially in the short run. Low rates of mobility can reduce employers’ options if they can’t get the ‘right’ workers or get rid of the obstreperous ones. According to Rosenbloom (1998) even strike-breaking became easier in the United States in the late 19th century thanks to rising worker mobility in an integrated national labour market. The contrast in mobility is supported by differences in national wage convergence: there was a lot of it in Japan before 1945 but not much in India whether at the national or regional level (Saito 2006; Collins 1999). Another indicator of how “surplus labour” a developing economy might be, is the reservation wage in manufacturing. This should be set as a premium over the opportunity in agriculture. The male Mumbai ratio fluctuated between 2 and 3 throughout the entire period, but female wages in Japanese textiles were usually not that much higher than in agriculture! India’s faux surplus-labour economy was manifest in a variety of other ways. Unlike double- or triple-shifts in Japan, most Indian mills never went beyond a single shift on a wide scale until the late 1930s. Indian mills relied on decentralised labour recruitment for an unusually long time. Roy (2008a, 2008b) observes that the “labour lord” was a ubiquitous feature of early industrialisation in most countries. But as labour markets deepened, management eventually took over the recruitment function themselves. This was the case in Japan, but not in India. Indian foremen or ‘jobbers’ recruited workers through their own connections based on caste, kinship, village origins, and city neighourhoods. These jobbers were powerful authority figures with patronage relationships. This system of recruitment resulted in an extreme form of labour market segmentation: each textile mill effectively faced numerous separate labour markets defined by each jobber’s network. So as a hypothetical example, the fancy weaving department at a mill could be composed entirely of Muslim guild weavers from a single village; or the lint waste removers entirely of untouchables from another village (Newman 1981). Thus there was no single “urban labour market” that the mills could tap, and the employers’ search costs were high. Jobbers often abused their position by taking bribes from prospective hires, and they might even help instigate strikes. But the mill owners found the jobbers indispensable for recruitment, because up to a third of the Bombay mill force were casual day labourers, i.e., hired on a daily basis as the fluctuating demand conditions in the product market required. And they also served as temporary replacements for the mills’ many absentee workers. In order to reduce turnover, the Japanese mills did offer more job amenities (often described as “paternalistic welfare policies”) in the form of schooling, health clinics, nicer housing, etc. These cannot be considered a failure, because turnover did fall over time. But, the primary means of job separation in Japanese cotton remained ‘running away’ or ‘absconding’ !! As Saxonhouse & Kiyokawa (1978) put it, “Japanese textile industry achieved world dominance in the first three decades of the 20th century using seemingly poorly motivated labor”. An interpretation which would reconcile all this information is that in its half-century of existence the Japanese textile industry, but not the Indian, had achieved optimal turnover. Turnover is usually evidence of workers’ ability to exit, i.e., something which reduces a firm’s control over workers. But it may have had quite different effects in Japan. On the one hand, high turnover has costs in terms of losing experienced workers and having to hire new ones you must train. A worker could not go right away from 4 looms to 6 looms with the snap of a finger. There was a costly period of training and learning, in terms of foregone output, in order to do the extra work (Bessen 2003). So the initial costs of higher machine assignments are lower with more experienced workers. On the other hand, high turnover has benefits because you prevent ‘fairness’ norms about pay or work loads from emerging. Since returns to experience in textiles diminished after a couple of years, employers did not necessarily benefit from workers who stayed in their jobs for years upon years, except for the handful selected to be supervisors. The benefits of turnover can exceed the costs if (a) the required skills are relatively easy to acquire; and (b) the required skills are general to the industry and not specific to the firm, which was the case in interwar textiles; and (c) the fraction of new hires with some industry experience at firms was rising over time. The ‘maturation’ of the local labour market in terms of a critical level of industry-level experience is tremendously stressed by Saxonhouse (1977) for Japan; Wright (1981) for the US South; Leunig (2003) and Bessen (2003) for New England. For the the Japanese textile industry, this was a self-reinforcing process since it was constantly shedding workers in the 1920s and 1930s. The Japanese mills therefore had a big enough “reserve army” of workers with just enough textile industry experience but not too much firm tenure. They could get rid of troublesome workers without worrying too much about lost production. However, the Indian industry faced a smaller pool of ‘excessively’ experienced workers — despite at least 70 years of existence. If those guys went on strike or you had to lock them out, you could not replace them as easily. Mazumdar (1973): the core of the stable work force at Indian mills was adult men with families permanently settled in the city. But the ‘badli’ temps were primarily men with families still in the village and never became a stable source of labour because they returned to their farms on a seasonal basis. That could be 4-6 months. Newman (1981): replacing a striking work force implied overcoming the decentralised system of recruitment, which was totally against the interest of the jobbers; and the badlis themselves were dependent on jobbers. It was a catch-22. Another indicator of the relative bargaining power of workers and employers is wage flexibility. At the beginning of the Great Depression, there was some downward nominal wage rigidity in most of the world — wages were slow to fall despite rising unemployment and contraction in output and profits. Employers are usually reluctant to cut wages in a recession because they don’t want to demoralise workers, or simply for fear of revolt by workers in defense of customary wage levels. According to Hanes (1993), the earliest signs of increased nominal wage rigidity in the United States can be dated to the late 19th century, when strikes and industrial disputes proliferated. In India, it took 5 years after the onset of the depression for nominal wages in the textile industry to begin falling, and the wage cut precipitated the general strike of 1934. In Japan, by contrast, nominal wages began falling immediately in 1929-30. (In the real wage data above, the initial nominal cut is obscured by the severe deflation of 1930.) Japanese mills could shed workers and slash wages at will. 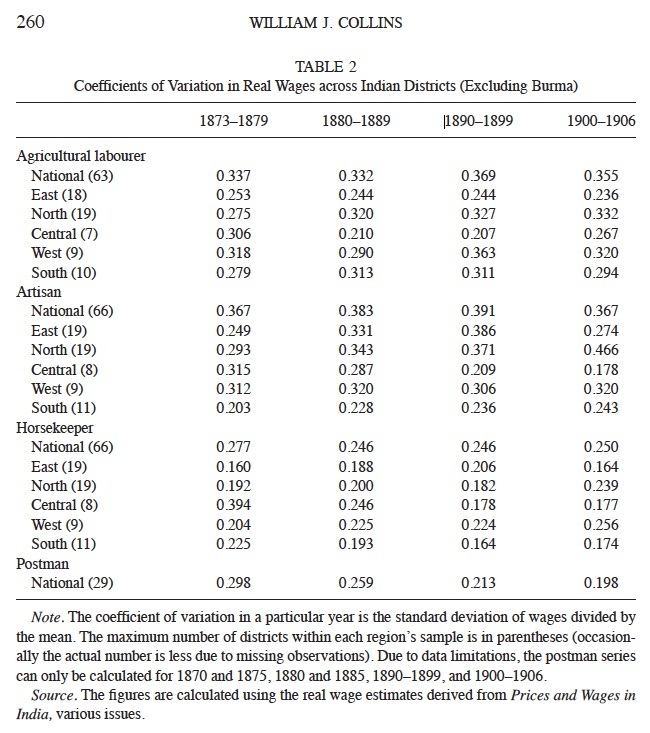 Indian workers’ militancy influenced production, not necessarily by raising wages per se, but by raising the wage at which a given level of effort would be supplied. Indian mill owners could not get workers to increase effort at manageable cost. Gupta (2011) argues that textile workers in Japan had more incentive to increase effort than in India because real wages grew faster in Japan. Even ignoring the massive wage clawback in Japan during the 1930s, the direction of causation between wage and effort is still ambiguous. But what’s not ambiguous: for any given increase in wages, Japanese mills squeezed much more productivity out of their workers than Indian mills. Whereas labour productivity growth exceeded real wage growth in Japan over the entire period 1900-1938, labour productivity in Indian textiles stagnated in the 1920s and 1930s, but real wages went up anyway. Japan’s ability to increase labour productivity without paying “too much” in extra wages was the cause of its vigorous expansion. The Indian industry’s lack of competitiveness was precisely its inability to achieve a wage-effort combination as good as Japan’s. Most scholars (e.g., Morris 1965) argue that before the Great War, Indian mills could afford to be ‘wasteful’ with labour use because wages were so low. But when Japanese competition arrived on the scene in India, the mills found they had to reorganise production and reduce labour costs, through some mix of wage cuts, increasing work intensity, and reducing employment levels. In Indian textile history, this is known as ‘rationalisation’. And the employers’ attempt to reduce employment at the mills while increasing wages for the remaining workers provoked the General Strikes of 1928 and 1929. But the ‘rationalising’ mills in India were no more profitable than before ‘rationalisation’ because the gains were offset by the extra wages paid to the work force retained to operate more machines. The profit rates of the ‘rationalisers’ were only about 2% against the 1.7% of the non-rationalisers. Wolcott & Clark’s estimate for the increase in Indian wages associated with a 1% reduction in labour requirements is 70-101%. Conversely, when mills were set up outside of Mumbai to escape from the higher wages, the lower productivity offset the wage savings. Thus Wolcott and Clark argue there existed across India the same pattern uncovered by Clark (1987) for the whole world: “labour inefficiency and wages varied inversely in such a way as to keep wage costs fairly similar across India”. Consistent with Wolcott & Clark, the labour costs in Ahmedabad were actually higher (the wrong sign!) and those in Mumbai only slightly lower than the rest of India. Gandhian collective bargaining at Ahmedabad apparently made no difference in terms of employers’ ability to reduce unit labour costs. Most of the time Indian strikes did not result in a win for workers in terms of formal employer concessions. But the credible threat of strikes was sufficient to make management wary of worker hostility. According to Wolcott (2006), “perhaps as much as 8.1 percent of capital was idled each year by strikes” in the mill cities of the Bombay Presidency. But it was not just direct costs. Indian workers drastically raised the marginal transaction cost of implementing organisational and technical changes. Unless you had really big changes to implement, and you had no other choice, the huge cost and risk was not worth it. In the Wolcott-Clark view, there was no managerial failure in India. The majority of Indian mills that did not bother with ‘rationalisation’ really lost nothing by it. The above is consistent with surveys of union effects on firms in the USA, such as Hirsch (2004) and Doucouliagos, Freeman & Laroche (2017): while the effect of unions on firm-level productivity is highly variable and on average zero, the effects are negative for firm profitability, investment, and management discretion. Given the rigidity produced by labour militancy, Indian mills also found it easier to lobby for tariff protection which they eventually got. That suited the Raj just fine because it would also protect Lancashire’s exports to India and reduce any urban unrest which might destabilise British rule. This is plausible. Alice Amsden spends the first half of her book, The Rise of the Rest, persuasively cataloguing the many managerial failures at manufacturing firms in Asia and Latin America before the Second World War. There’s also plenty of modern evidence collected by economists that management styles differ drastically across countries, and firm-level productivity varies systematically with management characteristics and ownership structures. (Businessmen and business historians: well duh!) Management may be a technology that managers must train in and learn-by-doing. Evidence from a randomised controlled trial in the late 2000s — using Indian textile mills no less! — does show quite wasteful managerial practises can persist. Productivity rose by 17% in those textile mills which took the free advice from a professional management consultancy. But why hadn’t management eliminated those wasteful practises on their own in that RCT? There are two clear reasons: high tariffs reduced import competition; and family ownership encouraged excessive centralisation. The family owners did not trust middle management and the few male members concentrated even the lowliest decisions at the top. Firm size in India (as in other developing countries) is frequently constrained by family ownership. But the argument made by Gupta and Roy is that Indian mill owners/managers were too hands-off and delegated too much authority. And it’s not clear whether a decentralised or a centralised system was ‘better’ in the pre-war textile industry. Indian mills had a form of internal subcontracting system based on jobbers. But so did Lancashire, which probably had the most decentralised system possible, with spinners and weavers being quasi-independent firms which hired their own employees, inside the larger Lancashire firms. Yet American mill management was more centralised and ‘Chandlerian‘. Japanese mills evolved from something like India in the 1880s to an extreme form of hierarchical control by the 1920s. Probably the possiblity of centralisation depended on labour resistance. Again, management discretion is endogenous with respect to labour relations! Toyo Podar was intended as the vanguard of further Japanese investment in India. But it was eventually sold off and nothing came of it. Japanese textile mills in Shanghai illustrate that management does matter, but it mattered through its control of labour. Before the mid-1920s, Japanese-owned mills in Shanghai had operated much like other cotton mills. They relied on local foremen or “number ones” — the Chinese equivalent of the Indian jobber. Unlike the Indian jobber, however, the Chinese number-ones were usually members of the Green Gang — a pervasive criminal organisation with strong links to the Chinese Communist Party and to the Nationalists (the Guomindang). The Japanese owners were determined to replicate at their Shanghai mills the management practises prevailing in Japan. That meant exerting direct control over all aspects of labour management from recruitment to shop floor supervision. That also meant replacing the gang-connected “number ones” with Japanese supervisors. And the factory work force would be converted from male-dominated (as in Indian and Chinese mills) to predominantly female (as in Japanese mills). The change also involved intensive monitoring and disciplining of workers, including corporal punishment. The Japanese paid a premium for these disamenities: wages at Japanese mills in Shanghai were ~25% higher than at non-Japanese mills. But the attempt at managerial transformation was powerfully opposed by the number-ones and the male workers, who activated their ties with the Green Gang and the Chinese Communist Party. The Japanese mills were then greeted with strikes at least as numerous and frequent in a short period as any faced by the Indian mills. One of the largest Japanese textile firms in Shanghai was hit with 44 strikes between February 1925 and November 1927, “by far the largest number of strikes in a three-year period against any business in Chinese history”, with almost 2 million worker-days lost! It did not help matters, of course, that all this coincided with the anti-foreign outburst of the May 30th Movement and the anti-Japanese boycotts. With the communists out of the way, and the Shanghai labour movement emasculated, the Japanese mill owners then made a bargain with the Green Gang. The Japanese got the female workers they wanted; cut down employment levels; and intensified work through higher machine/worker assignments. In exchange, the “number ones” were paid off with higher salaries, and the Green Gang could keep their labour recruitment racket (which was almost a semi-slave trade according to Honig 1983). Once again, productivities of both labour and capital went up, but labour productivity growth substantially exceeded that of the machinery. Machines per worker at Japanese-owned mills in Shanghai were not increased to the same level as in Japan, but they were higher than at Chinese-owned mills (Duus). Despite the higher wages at Japanese-owned mills, Zeitz says: “Normalizing unit costs in Japan at 1, I estimate production costs for the Japanese-, Chinese-, and British owned sectors as 0.79, 1.21, and 1.58, respectively. I have no idea why British and Chinese mills could not strike a similar deal with the Green Gang. Regardless, the Japanese reorganisation of Shanghai mills would have been impossible without the political turn against the communists and the trade unions. Of course labour historians have always been keenly interested in state and labour, but from the point of view of workers’ rights. Their lead is now followed by some in the current generation of economic historians focused on inequality and income distribution. But the ‘purely’ economic forces in the form of technical change and demand for labour were surely much more important in improving living standards than political bargains. I cannot prove, but also suspect: the hostile responses of the state to labour militancy in the early phase of industrialisation must have made a greater contribution to living standards than either the labour movement or legislation could have possibly made in the later phases of industrialisation. Some of the most famous acts of labour resistance and protest in the British Industrial Revolution were usually mobs rioting and lashing out — the Luddites, the Swing riots, Peterloo, etc. These were easily quelled by a state acting decisively to protect Property Rights and Innovation, or siding with Capital at the expense of Labour. (The right choice of verbiage depends on your native dialect of political economy.) The British state responded by fielding thousands of troops on the ground, hanging machine-breakers, and deporting troublesome ‘Jacobins’ to lonely corners of the world. But the British state also placed restrictions on the labour movement. The Combination Acts of 1799 essentially made strikes and unions illegal by declaring them monopolistic restraints of trade. (Yet there were no laws against employer combinations.) This was later repealed and unions made theoretically legal, but the Combinations of Workmen Act 1825 kept striking technically illegal or subject to civil liability until the last quarter of the 19th century. Under the Master & Servant laws, British workers were criminally prosecuted for breach of contract due to “absence from work, moving to another employer, misbehaviour or insubordination” (Wallis). And there were thousands of prosecutions by special magistrates often drawn from amongst employers, and this law was not repealed until 1875. In the United States of the Gilded Age, court injunctions and numerous other legal remedies were available to employers to deal with striking workers. The strong presumption in favour of freedom of contract meant US courts frequently interpreted strikes or actions in support of strikes (boycotts, picketting, etc.) as violations of property rights — in fact, until 1914, strikes could be subject to the anti-trust laws! “Under prevailing legal interpretation, strikes were often found by the courts to be conspiracies in restraint of trade with the result that the apparatus of government was often arrayed against labor” (Rosenbloom 2008). American federal and state troops were also deployed in labour disputes: “between 1877 and 1892, the modal use of American militia was to quell labor unrest” (Naidu & Yuchtman 2016). The greater success rate of big strikes in France was likely enabled by accomodating interventions of the French state, at least when compared with the United States (Friedman 1988). But did any of these matter to economic development? I really don’t know. I’m not suggesting that state repression of labour might have worked by lowering wages. Nor am I asking about working conditions. Rather, I’m asking: by restraining the monopolistic strength of worker combinations, did the state increase the ability of firms to undertake measures which increased productivity? Such issues are largely neglected in economic history and development. All arguments about technology, human capital, and industrial policy implicitly hold industrial relations constant — take them as given. In the 1970s and 1980s, there was a lot of scholarly attention to the “urban bias” in developing countries, where the state appeased urban rent-seekers including trade unions. (See for example Bates’s States and Markets in Tropical Africa.) But that’s also now a largely forgotten line of inquiry. The overwhelming majority of farm girls, however, either remained industrial workers throughout their teen years and often even after marriage to fellow industrial workers, or else retired at marriage to lead the life of urban working-class housewives. Even during the depression-ridden 1930s, only 22.5 percent of the mill workers of rural origin returned to the farm, and of these only a quarter were in registered marriages within a year of their retirement”. Then there’s the interwar surge in labour disorder and greater union activism, a sign of increasing commitment by workers to their jobs. Early in the Great Depression, Japanese textile workers faced their firms’ draconian retrenchments and, like their Indian counterparts, they lashed out against ‘rationalisation’. “In this broad outline, the [Toyo Muslin] dispute was typical of dozens of textile strikes in 1930. The additional event that made the Toyo Muslin workers famous was the riotous demonstration on October 24 joined by hundreds of young female workers. A support group led by the prominent left-wing socialist Kato Kanjii organized the demonstration as part of its effort to build a regional general strike out of the widespread unrest in Nankatsu factories. Representatives from 115 factories in the area had attended a “Factory Representatives’ Council” on October 7 and resolved to support all area strikes in hopes of bringing on a general strike. “At a second meeting on the 21st, they resolved to rally in support of the Toyo Muslin strikers on the night of the 24th…When authorities extinguished the street lighting, the demonstrators marched through darkened streets toward the Toyo Muslin factory singing the Internationale and shouting slogans. They threw stones, smashed streetcar windows, and fought police, who arrested 197 demonstrators, including 4 of the women. Over 20 workers were injured. The event was subsequently dubbed simply “the street war.” (Gordon 1992, p245). This suggests you could not take for granted that strikes in the Japanese textile industry were naturally rare and sporadic. If they could have done, and if given half the chance, Japan’s textile workers would have organised collectively to improve their bargaining position with employers. So the state’s attitude to monopoly unionism probably mattered. Before the mid-1920s, the Japanese state was unambiguously “intolerant of the efforts of workers to organize themselves to advance their own interests” (Garon 1987, pg 29). Article 17 of the Public Order & Police Law outlawed strikes and unions de facto through a ban on ‘instigation’ and ‘incitement’ of “others to strike, join unions, or engage in collective bargaining”. And unlike some other countries with similar laws, the Japanese police regularly enforced them. A combination of police arrests and military deployment put down four of the largest strikes in the labour unrest f0llowing the Great War (Yawata Steel Works, Tokyo Streetcar Company, Kawasaki Shipywards, & Mitsubishi Shipyards). But the interwar period also saw divisions within the Japanese government between reformists at the Home Ministry who advocated liberal labour legislation in order to encourage the ‘responsible’ elements within the labour movement; and conservatives at the Justice Ministry who opposed such measures and proceeded with unabashed repression. Article 17 was repealed, but repression continued under the new Peace Preservation Law: “After the 1925 repeal of Article 17, administrative regulations provided sanctions for continued repressive measures, and the number of workers arrested in strikes actually rose. Laws restricting assembly, ‘dangerous meetings’, or seditious publications served to hinder the labor movement as well” (Gordon 1988). Despite the surge in labour’s share after 1915, it was dramatically clawed back after its peak in 1923. (The correlation with economic growth rates is modest at best.) Over the same period, the labour share rose continuously in France and fell modestly in the UK from a much higher base. If Japan had a true developmental state whose priority was to support business, then the first priority of the British Raj was the preservation of British rule. To serve that end, it became more expedient to accommodate Indian labour than collaborate with Indian capitalists in constraining labour’s strength. But this is only evident by comparison. In one of those innumerable British enquiries on Indian labour issues, you can find extraordinary exchanges between labour leaders and businessmen serving as witnesses. In one instance, Victor Sassoon, an owner of several large mills in India as well as a luminary of Bombay’s Iraqi-Jewish community, is questioned about ‘terrorism’ by S.A. Dange, the Marathi labour leader and one of the founders of the Communist Party of India!! In another exchange, the non-communist labour leader, N. M. Joshi of the All-Indian Trade Union Congress, probes Mr Sasakura of a Japanese-owned cotton mill in India about the police repression of radicals in Japan. In other words, in the surrealism of interwar British India, a communist could interrogate a captain of Indian industry, and the other major unionist could badger an important foreign investor in the country! Yet, India is full of scholars and journalists hysterical about the repression of Labour by the colonial State on behalf of Capital, or some such twaddle (e.g., DeSousa 2010). A more sane assessment is this: like Japan, the British Raj was also kind of schizophrenic in its carrot-and-stick approach on labour issues. And like the Congress Party that succeeded it, the British Raj tried to marginalise the communists from the labour movement by competitively placating workers at the expense of business productivity. On the other hand, the British sought to defuse worker grievances and reduce the chance of strikes in the first place. First and foremost, Britain’s accomodation with labour was reflected in a variety of factory legislations affecting factory conditions, working hours, workmen’s compensation for injuries, etc. Labour representatives were also guaranteed seats in the Central Legislative Assembly and contested seats in the provincial and municipal assemblies. Not to mention, dozens of committees of official inquiry investigated everything ranging from strikes to wages to mill conditions. The British Raj was trying to create an institutional framework for “responsible trade unions” to engage in negotiations and conciliation with employers, and avert or settle strikes before they got out of hand. However, the British model of “responsible trade unionism” was more liberal than what the Japanese reformists were contemplating around the same time. It could be the independent British trade unionist engaged assertively but peacefully in collective bargaining. But there was also an actual Indian example to follow. In 1920, before it was technically legal to do so, Gandhi had helped found the Ahmedabad Textile Labour Association and won over the city’s mill owners to a true collective bargaining system. Without renouncing the credible threat of strikes, it won better working conditions (and extraction of rents) through negotiation and arbitration. So Britain enacted the Trade Union Act for India in 1926 — which set up a legal registration system for formal unions and exempted them from civil and criminal liability in the event of strikes, one of the first priorities sought by most labour movements around the world. By contrast, in Japan, numerous union legislations were mooted and debated between 1920 and 1931, but none ever passed. Not even a liability exemption law! Although the legislation partly reflected the increasingly liberal norms about labour issues within Britain, it was primarily intended to steer the Indian labour movement in a ‘healthy’, non-communist direction and keep it focused purely on industrial disputes. Besides, it was better that Indian workers were represented by a real union leadership who could be negotiated with, rather than remain a headless mass of aggressive but inarticulate grievances, as had been so often the case in Bombay and Calcutta. I’m not arguing the British Raj enhanced Indian workers’ bargaining power. I agree with Roy & Swamy (2016) that most of the legislations probably made no difference in that respect. How could it have done, when, as we’ve already seen, Indian workers apparently already possessed extraordinary spontaneous strike capabilities? And, as we’ve also already seen, it made no difference whether there was a real union organisation, as in Ahmedabad, or strikers spontaneously taking the initiative with unions scrambling to follow, as in Bombay. The effect on the textile mills was the same: an organisational rigidity which made it difficult for employers to reduce unit labour costs. British officials also grew more alarmed by the apparent strength of the communist union in the General Strikes of 1928-9. Communists even set up “workers’ committees” aka cells inside textile mills (Newman 1981, pp 228-9). In Ahmedabad, the Gandhian unionists were forced to compete for workers’ loyalty with the pugnacious local communists, who seemed to appeal particularly to Muslim weavers (Patel). So as part of a greater effort to stamp out communist influence in the labour movement, there would now be more direct state intervention in labour disputes. Governors of Bombay or the police commissioner had often informally mediated during strikes and pressured the mill owners to settle. But new legislation formally provided for a Labour Officer to receive worker grievances and intercede with businesses. Another law put restrictions on the fines and penalties employers could charge against wages, although under the piece rate system that was an important means of discipline at textile mills. At the same time, there would be some legal regulations of strikes. The Trades Disputes Act of 1929 prohibited strikes without notice or strikes in public utilities, as well as strikes with “any object other than the furtherance of a trade dispute within the trade or industry”. Some argue in the 1930s the British relied more on loosely defined police powers under the Bombay Special Emergency Powers Act and the Criminal Law Amendment Act in order to act against labour. In the Meerut conspiracy case (1929), the Raj prosecuted communists accused of conspiring to overthrow the King-Emperor, although some of the arrested were British radicals agitating in India. But as Stolte (2013) shows, British intelligence was concerned with the accused’s “international connections” (i.e., Comintern and the Soviet Union), not their labour activism per se. At any rate, none of that had much lasting effect on anything, because the British didn’t really have the stomach for truly extirpating communists out of the Indian labour movement. After the 1929 strike ended, membership in most formal unions melted away, but wildcat or lightening strikes remained common through the early depression years. The communist penetration of textile workers came back with a vengeance in the General Strike of 1934, as though nothing had changed since 1929. The Communist Party was then banned in 1934, but the ban was lifted in 1937; and during WW2, when Congress leaders were all in prison, the communists were free because they supported the war!!! Communist parties around the world had switched from anti-war to pro-war in June 1941. In comparative global and historical perspective, the British attitude was hesistant and stumbling. India’s strikes speak eloquently for themselves. If Bombay-scale strikes had ever materialised in the USA in the 1890s, there would have followed, as actually happened in so many American strikes, federal troops, state militias, Pinkertons, courts issuing injunctions against strikes like spittle out of judges’ mouths, and one railway car after another full of scabs arriving from all parts of the country. If strikes had brought Osaka or Tokyo to a virtual standstill for 18 months, as happened in Mumbai in 1928-29, the Japanese government would have declared martial law and compelled the strikers back to work many months earlier! Given its record of interventions, it’s unimaginable the Japanese government would have allowed such a thing to happen to the country’s greatest export industry. The Raj was not squeamish if violence was deemed necessary. After all, they put whole cities like Peshawar and Sholapur under shoot-to-kill martial law declarations, in order to stamp out civil disorder or hunt down violent revolutionaries. And the British were perfectly capable of unambiguously anti-labour use of force if the dispute affected a strategic state asset like the Indian railways. The several large railway strikes in 1928-30 across the country saw some use of auxiliary militias against workers rebelling against … you guessed it… ‘rationalisation’. Another category of labour dispute fit for similar treatment was on behalf of British-owned plantations in eastern India. In the so-called Chandpur Incident of 1921, tea plantation coolies in Assam decided to run away from their miserable working conditions and repatriate en masse to their home provinces, without the employers’ permission. The situation ended up with the military police firing on them at a railway station (Karnik). In the final analysis the British Raj was not a “committee for managing the common affairs of the [Indian] bourgeoisie“. Labour’s inhibition of Indian business was secondary, as long as it was not a challenge to British rule, or as long as it did not turn violent. In The Empire of Cotton, Sven Beckert argued that the British Raj undermined Indian industrialisation through the imposition of free trade, but at least “Indian cotton industrialists … drew on the colonial state for the mobilization of labor”. In his Polanyist hallucination Britain had ‘enclosed’ the Indian countryside and “drove huge numbers of workers into cities and into cotton mills”. But if Beckert had ever turned his eyes away from cotton, he might have noticed that the British Raj actually did engage in a substantial and deliberate “mobilisation of labour” — but on behalf of British-owned industries in eastern India. In one of the most famous works of Indian economic history, Private investment in India, 1900-1939, Amiya Kumar Bagchi suggests this might have made an important difference to the evolution of industrial relations in cotton versus jute textiles. The cotton mills of western India were owned by Indians — Parsis, Gujaratis, Ismaili Muslims, and Indian Jews. But the industrial and export-oriented commodity sector of eastern India was largely owned by the British — the tea plantations of Assam, the coal mines of Bihar and Bengal, and the jute textile mills of Calcutta. This was the longest British-ruled part of India where a kind of “Latin American” planter and extractive class dominated. After cotton, the jute textile industry of Calcutta was the second modern industry of late colonial India, principally devoted to producing gunny sacks — an important packing material for trade before WW2. It also had some famous military uses. Eastern India was the primary destination of the vast majority of India’s internal migrants who sought work outside their home region. And the legal apparatus for the recruitment of labour for the eastern plantations included some of the most illiberal aspects of British colonial labour policy, complete with worker tying, anti-enticement laws, legal restrictions on ‘absconding’, and rights of private arrest by employers. Although Calcutta is a Bengali-speaking city, Bengalis were a minority in the jute mills whose work force was much more heterogeneous than the cotton mills. Many US labour historians have long argued union-organising and strike solidarity were impeded by the ethnic heterogeneity of workers in the USA. Unlike the Bombay Presidency’s relationship with Indian mill owners in western India, the provincial governments of Assam, Bihar, and Bengal were often creatures of the British industrialists in eastern India. All of these things seem reflected in labour market data. Unlike cotton wages, jute textile wages look much more like those of a “surplus labour economy”, whether in nominal wages or real wages or the premium over agriculture. In fact the real wages of jute textile workers in Calcutta barely registered an increase over time. Strikes in Calcutta jute were by no means trivial but less frequent than in cotton and involved substantially fewer man-days lost — about 3.5 days per worker per year in 1921-38, against 10.5 days per worker per year in cotton. Only about 4% of the jute workers belonged to a formal union in 1929, compared with 42% in Bombay and 28% in Ahmedabad. Most people who are inspired by the trade and industrial policies of East Asia, or the 19th century USA, tend to overlook or discount the labour repression that accompanied them. South Korea had militant trade unions kept in check by Park Chung Hee and Chun Doo-hwan. Chiang Kai-shek was not nice to unions, either. Post-war Japan, thanks to MacArthur, was the most progressive in East Asia, but Japanese unions are “enterprise unions” and there is no centralised collective bargaining as you find in Western Europe. After independence, the Congress Party was in one sense typical of “Third World socialism” — it competed with communists for the loyalty of the urban workers. Perhaps we can call it “democratic Nasserism”, but it also stands comparison with Mexico’s Institutional Revolutionary Party whose power was also founded on a combination of crony capitalism and trade unionism. If the communists had an incentive for confrontation to signal their value to workers, then the state had an incentive to prevent them, and Congress-affiliated unions had an incentive to preemptively offer rents to workers. The interwar Indo-Japanese divergence in textiles foreshadows China’s commanding lead over India after 1990 in exports of labour-intensive manufactures. A neglected element of that lead may be that China was unencumbered by post-independence India’s industrial relations and resistance from refractory workers. Even within India, states with more pro-worker legislation experienced slower growth in manufacturing in the period 1958–1992. Rodrik & Subramanian (2005) argue (inter alia) that the origins of India’s economic reform went back to the 1977 election in which the Congress Party was defeated for the first time since independence. After the 1980 return to power, Congress became selectively more pro-business, and state governments in India which were allied with Congress “experienced differentially higher growth rates in registered manufacturing”. But the late 1970s and early 1980s break in the trend growth rate (also found by DeLong) coincides with a pronounced change in labour disputes. The height of trade union power in India had been in the 1960s and 1970s. And Indian unions were literally Luddite, blocking the introduction of technology. For example, Candland (pp 30-31) says the bank tellers’ union blocked the introduction of computers for 20 years! Yet during the martial law of 1975-77, the Congress Party switched from being collaborators with trade unions to breaking them. The reduction of union power has not been explored as a contributor to India’s growth transformation. This entry was posted in cotton, cotton textiles, India, Japan, labour, Lancashire, New England textiles, strikes and tagged cotton, Indian textile industry, industrial relations, Japanese textile industry, labour resistance, labour unions. Bookmark the permalink. Impressive. One of the best econ post i´ve come across. And the bit by Marx is priceless. I have always thought that bridged editions of his magnum opus should only include personal confrontations. Still absorbing this post, but it has given me a new favorite expression: “monopsonistic tendencies”. My main impression, which I hope was intended, is of the incredible, model-defying detail that underlies the broad divergences – and other stock issues – of economic historians. What William Easterly cautions about aid-granting seems to apply equally to generalization-making. Relationship between workforce structure and the presence/absence, success/failure of labor repression was especially striking. As everyone has said excellent! Detailed, informative, fair and challenging like the best posts should be. Basic thesis I have no objection too. No getting around it, gendered labour control was a critical asset in gaining competitive advantage in cotton (and presumably silk too) textile in the pre-WWII period. And this has made it clear to my previously muddled brain (which had read Broadberry but still had found myself wanting to be contrarian to the qualitative side of the literature). But I would ask the question; where are my agglomeration economies? I read my Leunig and my Crafts telling me external economies of scale matter in cotton a lot to explain the length of Lancashire’s dominance. And indeed the concentration of the cotton industry in Osaka seems to suggest such as well for Japan too. The story here appears to put down a story of the core workforce being particularly specialised enough. Although we still have managerial/mechanic labour to consider. Not to mention input firms (which would include a certain Toyota), information sharing etc, in the context of a competitive market. Second is that of what about the Postwar Japanese situation? Have you read Macnaughten’s work? I mean textile factories dying off in the 1970’s in the midst of booming electronics and automobile industries is about as “natural” a death as one could hope for in a catch-up economy after having done their service of getting Japan up and going in the 1950’s. But postwar Japan is the Japan of Labour unions including textiles, land reform, a much more progressive taxation policy with growing social benefits. I think dismissing that Japan as a place of “enterprise unions” is a bit weak. Is there the Liberal/Social-democratic sweet spot? Third is more a thought, there is a chicken and egg problem with regards to “capitalism” and “gender” in these circumstances; this is where Tsurumi annoyed me since her investigation of this was so. Was the Meiji to early Showa period a time of intensifying gender inequality to satisfy national industrial development? Or did the farming dads and callous textile head honchos simply take advantage of an extant gender inequality? This post was about factor prices not living standards, but one is tempted to wonder about the women of the Bengali textile workers living standards vs the women their husbands competed against thousands of miles away. (1) I don’t think I stressed gender that much. India’s inability to deploy female labour on a scale comparable with male labour is just one of many ways its “surplus labour” economy was faux. (2) Agglomeration economies. I don’t think this element matters in this story. In the British case, AE matters in explaining how Lancashire maintained its advantage pre-1914 even as other countries had a big wage advantage. Besides, surely agglomeration economies ‘should’ have been stronger on the Indian side since the export industry was concentrated in Bombay whereas in Japan the industry was basically split between Osaka and Tokyo, and the weaving sector was even more dispersed. It is true the Japanese firms might have shared more information through its industry association and it is possible the Indian firms were less cooperative with one another. (3) Post-war. The post-war textile industry is a very different story, because it was much more capital-intensive. For example, in the mid-1930s, automatic looms (whether made by Toyoda or not) were only 12% of the Japanese weaving industry’s loom capacity. By the 1960s, it’s almost 100%. And there’s much more technological progress overall and the effect of new technology swamps other effects. Suppose, hypothetically, unions in 1946 fixed the number of automatic looms per worker to 20. That no longer matters because the entire weaving sector is switching over to automatic looms and the productivity effect from that swamps any restriction by labour. But don’t downplay the fact that Japanese enterprise unions were cooperative. That’s really one hell of a post and interesting.